88 shoreline camps are available along the Arizona side of Lake Havasu, from Lake Havasu City south to the Parker Dam. Most sites have a picnic table, shade ramada, barbeque grill, pit toilet, and trash can. The camps are available on a first-come, first-serve basis. The user fee for these camps is $10 day use per site + $10 overnight per site. Fees are for up to six (6) people, with a $2 fee for each additional person. Overnight fee paid is good until 9 a.m. the following day. These sites are only accessible by watercraft. Launch Ramps Available: Take-Off Point and Havasu Springs Resort, near Parker Dam off Highway 95, on the south end of the lake; Cattail Cove State Park, nine miles south of Lake Havasu City; near the London Bridge, at Windsor Beach State Park and other marinas and campgrounds in Lake Havasu City. There are boating, fishing, camping, and other facilities available on the Chemehuevi Indian Reservation. Permits are required. For more information call the tribal office at (760) 858-4301. On the California side, drive between Needles and Vidal Junction on Highway 95 and take Seventeen Mile Road east to Lake Havasu. From the Arizona side, a water taxi is available in the London Bridge Village in Lake Havasu City. Two private resorts are located on leased public lands along the lake shore. These provide many recreation opportunities and facilities including camping, boat ramps and marina, swim beach, stores, restaurants, laundry, and longer-term mobile home spaces. Havasu Springs is located northeast of Parker Dam on Highway 95. Black Meadow Landing is west of the dam. Turn west on the first public road south of Parker Dam and follow the signs to the resort. Free public fishing access is being developed through the Lake Havasu Fisheries Improvement Program, a cooperative partnership. 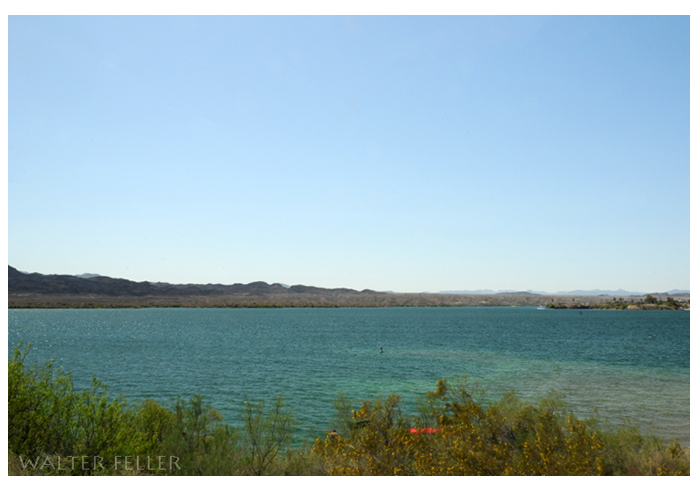 Current sites include Take­off Point, Havasu Springs, Site Six, and Mesquite Bay. Sites include parking, restrooms, and universally-accessible fishing docks. A valid Arizona license is required for taking wildlife (including fish) in Arizona. Details are available at the Arizona Game and Fish License Page. Take-Off Point access is on Alt Hwy 95 at Parker Dam on the Arizona side. Havasu Springs is located northeast of the dam on Highway 95. Site Six, in Lake Havasu City, is off McCulloch Blvd west over London Bridge to the end of the Island. Mesquite Bay on the Havasu National Wildlife Refuge has two sites located on London Bridge Road north of Windsor Beach State Park. Standard Wash is a popular staging area for backcountry ventures for four wheel drive, dune buggy, motorcycles, and other OHVs. Except for the Open Areas located on the Parker Strip, all OHV users must remain on existing roads and trails. From Lake Havasu City drive south on Highway 95 about 5 miles (8 km) south of the city limits. An information bulletin board is on the east side of the road. Parker Dam creates Lake Havasu by blocking the Colorado River. Construction of the dam began in 1934. It was completed in 1938. The initial purpose of the dam was to provide a reservoir of water to pump to Southern California through the Colorado River Aqueduct, a project initiated and still managed by the Metropolitan Water District. The dam also generates electricity. Constructed in the late 1970s, the Central Arizona Project uses the reservoir for pumping water to Phoenix and Tucson. The dam is administered by the Bureau of Reclamation. Located about 25 miles (40 km) south of Lake Havasu City, the dam can be accessed from Highway 95 on the Arizona side. From Parker, Arizona, the dam can be accessed by the scenic Parker Dam Road on the California side. Special Activity and Recreation Area (SARA) Park is a county leased recreation area. Improved facilities include baseball fields, a bicycle moto-cross track, shooting range, radio­controlled airplane and event area, and race track. SARA Park also provides access to hiking and mountain bike trails. To access the popular Crack-in-the-Rock trail look for two small parking areas along the southwest boundary. This trail goes to the lake by way of a unique slot canyon. Remember to observe the shooting range boundary signs! The north entrance to the park road loop is located at McCulloch Blvd. South. The south entrance is about one mile (1.6 km) south on Highway 95. The Public Room of the office is a mini-museum complete with displays of prehistoric and historic artifacts, photo exhibits, live snakes and native and sport fish aquariums. Maps and access information are available at the front desk. If you have specific questions about a BLM program, specialists are usually available. The Lake Havasu Field Office is located south of the intersection of Highway 95 and Acoma Blvd. South at 2610 Sweetwater Ave. Office hours are 7:45 to 4:30 Monday through Friday excluding Federal holidays.